Size of this PNG preview of this SVG file: 453 × 599 ਪਿਕਸਲ. ਹੋਰ ਰੈਜ਼ੋਲਿਊਸ਼ਨਜ਼: 181 × 240 ਪਿਕਸਲ | 363 × 480 ਪਿਕਸਲ | 453 × 600 ਪਿਕਸਲ | 580 × 768 ਪਿਕਸਲ | 774 × 1,024 ਪਿਕਸਲ | 1,000 × 1,323 ਪਿਕਸਲ. 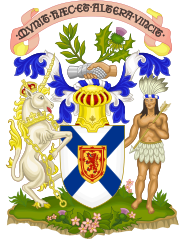 English: Coat of arms of Nova Scotia, Canada, granted by King Charles I (19 November 1600 – 30 January 1649) in 1625. Français : Armoiries de la Nouvelle-Écosse, Canada, accordées une première fois en 1625 par le roi Charles 1er (19 novembre 1600, Dunfermline – 30 janvier 1649, Londres). This W3C-invalid coat of arms was created with Inkscape, or something else.